Actor Ethan Hawke gives a speech before planting his hands and feet in cement at the TCL Chinese Theatre in Hollywood on Thursday, Jan. 8, 2015. HOLLYWOOD, LOS ANGELES (KABC) -- Actor Ethan Hawke planted his hands and feet into cement in front of the TCL Chinese Theatre Thursday, solidifying his mark on Hollywood. "To be a part of that legacy, to be a member of that community is all that I've ever, ever wanted. For you guys to welcome me means so much to me," Hawke said. Ethank Hawke's hands and feet are printed into cement at the TCL Chinese Theatre in Hollywood on Thursday, Jan. 8, 2015. 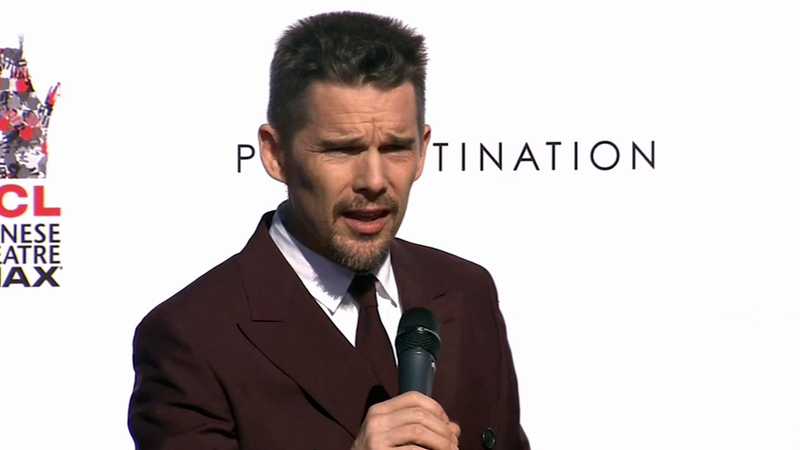 The three-time Oscar nominee received the honor a day before the release of his latest film, "Predestination." During the ceremony, he also spoke about the terror attacks in France. "I stand in solidarity with everyone in Paris and everybody all over the world who stand for freedom of speech. We are with you and we thank you," Hawke said. Peter and Michael Spierig, who directed "Predestination," co-star Sarah Snook, producer Jason Blum and Richard Linklater were in attendance. Hawke's major credits include romantic dramas "Before Sunset" and "Before Midnight," "Training Day" and most recently "Boyhood."